The Hunger Games is a 2012 American science fiction-adventure film directed by Gary Ross and based on Suzanne Collins’s 2008 novel of the same name. It is the first installment in The Hunger Games film series and was produced by Nina Jacobson and Jon Kilik, with a screenplay by Ross, Collins, and Billy Ray. The film stars Jennifer Lawrence, Josh Hutcherson, Liam Hemsworth, Woody Harrelson, Elizabeth Banks, Lenny Kravitz, Stanley Tucci, and Donald Sutherland. The story takes place in a dystopian post-apocalyptic future in the nation of Panem, where a boy and a girl from each of the nation's 12 Districts are chosen annually as "tributes" and forced to compete in The Hunger Games, an elaborate televised fight to the death. Katniss Everdeen (Jennifer Lawrence) volunteers to take her younger sister's place, and with her district's male tribute, Peeta Mellark (Josh Hutcherson), travels to the Capitol to train and compete in the games. Development of The Hunger Games began in March 2009 when Lions Gate Entertainment entered into a co-production agreement with Color Force, which had acquired the rights a few weeks earlier. Collins collaborated with Ray and Ross to write the screenplay. The screenplay expanded the character of Seneca Crane to allow several developments to be shown directly to the audience and Ross added several scenes between Crane and Coriolanus Snow. The main characters were cast between March and May 2011. Principal photography began in May 2011 and ended in September 2011, with filming taking place in North Carolina. The film was released on March 21, 2012, in some European countries and in the US and UK on March 23, 2012, in both conventional theaters and digital IMAX theaters. Japan received it last, on September 28. When the film released, it set records for opening day ($67.3 million) and opening weekend for a non-sequel. At the time of its release, the film's opening weekend gross ($152.5 million) was the third-largest of any movie in North America. It is the first film since Avatar to remain in first place at the North American box office for four consecutive weekends. The film was a massive box-office success by grossing over $694 million worldwide against its budget of $78 million, making it the third-highest-grossing film in the United States and ninth highest-grossing film of 2012. It was released on DVD and Blu-ray Disc on August 18, 2012. With 7,434,058 units sold, the DVD was the best-selling DVD of 2012. The second installment, The Hunger Games: Catching Fire, was released on November 22, 2013, in the United States. The Hunger Games received positive reviews from critics, with praise for its themes and messages, as well as Jennifer Lawrence's portrayal of Katniss, though there was criticism of the film's use of shaky cam, especially in the action sequences. Like the novel, the film has been noted for its similarities to other works, including the Japanese novel Battle Royale and its film adaptation, Robert Sheckley's short story "Seventh Victim" and its Italian film adaptation The 10th Victim, and the Shirley Jackson short story "The Lottery", with some criticizing The Hunger Games for being derivative of such works. Collins stated in an interview that her novel and screenplay drew on sources of inspiration such as the myth of Theseus, Roman gladiatorial games, reality television, and the desensitization of viewers to media coverage of real-life tragedy and war, not to think as just an audience member, "Because those are real people on the screen, and they’re not going away when the commercials start to roll." The song "Safe & Sound" sung by American singer Taylor Swift featuring The Civil Wars, won a Grammy Award and was nominated for a Golden Globe Award for Best Original Song. For her performance, Lawrence won the Saturn Award for Best Actress, the Broadcast Film Critics Association Award for Best Actress in an Action Movie, the Empire Award for Best Actress and was also nominated for the New York Film Critics Circle Award for Best Actress. As punishment for a past rebellion, the 12 districts of the nation of Panem are forced by the Capitol to select two tributes, one boy and one girl between 12 and 18, to fight to the death in the annual Hunger Games until there is only one survivor. In District 12, after her younger sister Primrose is chosen, Katniss Everdeen volunteers to take her place. She and fellow tribute Peeta Mellark are escorted to the Capitol by chaperone Effie Trinket and mentor Haymitch Abernathy, a past victor. Haymitch stresses the importance of gaining sponsors, as they can provide gifts during the Games. While training, Katniss observes the "Careers" (Marvel, Glimmer, Cato and Clove), volunteers from the wealthy Districts 1 and 2 who have trained for the Games from an early age. During a televised interview with Caesar Flickerman, Peeta expresses his love for Katniss, which she initially sees as an attempt to attract sponsors; she later learns his admission is genuine. At the start of the Games, Katniss ignores Haymitch's advice and grabs some of the supplies placed around the Cornucopia, a structure at the starting point, and narrowly escapes death. Half of the 24 tributes die in the initial melee, and only eleven, including the Careers, survive the first day. Katniss tries to stay away from the others, but the Head Gamemaker, Seneca Crane, triggers a forest fire to drive her towards them. She runs into the Careers, with whom Peeta has seemingly allied, and flees up a tree. Peeta advises the Careers to wait her out. The next morning, Katniss notices Rue, District 11's young female tribute, hiding in an adjacent tree. Rue draws her attention to a nest of tracker jackers, genetically modified venomous wasps. Using a knife, Katniss saws the branch holding the nest off of the tree, causing it to fall on the Careers; Glimmer succumbs to the stings and dies, while the others escape to a nearby lake. Katniss is disoriented from being stung a few times; in a hallucination, Peeta returns and tells her to flee. Rue helps Katniss recover, and the two become friends and allies. Katniss destroys the supplies the Careers have stockpiled by detonating mines guarding them, while Rue provides a distraction. Katniss later finds and frees Rue from a net trap, but Marvel impales Rue with a spear thrown at Katniss, who then fatally shoots him with an arrow in response. Katniss comforts Rue and, after she dies, adorns her body with flowers. Afterward, she makes a three-finger salute to the cameras. This triggers a riot in District 11. President Coriolanus Snow warns Crane about the unrest that has been caused under his watch. Haymitch persuades Crane to change the rules to allow two winners provided they are from the same district, suggesting that this will pacify the public. After the announcement, Katniss searches for and finds a gravely wounded Peeta. Another announcement promises that what each survivor needs the most will be provided at the Cornucopia the next morning. Despite Peeta's strong opposition, Katniss leaves to get medicine for him, but is ambushed and overpowered by Clove. When Clove gloats about Rue's death, Thresh, District 11's male tribute, appears and brutally kills Clove by breaking her skull. He spares Katniss, for Rue's sake. Katniss takes the medicine, which heals Peeta. While hunting for food, Katniss hears a cannon go off, signaling a death. She races to Peeta and finds he has unknowingly collected deadly nightlock berries. They discover "Foxface", District 5's female tribute whose name they didn't know, dead from the berries she assumed were edible from watching Peeta. Crane then unleashes genetically modified beasts. They kill Thresh and force Katniss, Peeta and Cato onto the Cornucopia's roof. There, the last survivors must fight to a stalemate. Cato gets Peeta in a headlock and uses him as a human shield against Katniss's bow. Peeta directs Katniss to shoot Cato's hand, enabling Peeta to throw him to the beasts below. As Cato is torn apart, Katniss kills him with an arrow in an act of mercy rather than leaving Cato to suffer a more horrific death. However, the rule change about two victors is suddenly revoked. Peeta urges Katniss to shoot him, but she convinces him they should eat the nightlock together. Just before they do, Crane hastily declares them co-victors. Afterward, Haymitch warns Katniss that she has made enemies with these acts of defiance. Crane is then locked in a room with nightlock berries. Jennifer Lawrence portrays Katniss Everdeen, and had her hair colored dark brown for the role. In March 2009, Lions Gate Entertainment (known as Lionsgate) entered into a co-production agreement for The Hunger Games with Nina Jacobson's production company Color Force, which had acquired worldwide distribution rights to the novel a few weeks earlier, reportedly for $200,000. Alli Shearmur and Jim Miller, president and senior vice president of motion picture production at Lionsgate, took charge of overseeing the production of the film, which they described as "an incredible property... a thrill to bring home to Lionsgate". The studio, which had not made a profit for five years, raided the budgets of other productions and sold assets to secure a budget of $88,000,000—one of its largest ever—for the film. Collins' agent Jason Dravis remarked that "they [Lionsgate] had everyone but the valet call us" to help secure the franchise. Lionsgate subsequently acquired tax breaks of $8 million for shooting the film in North Carolina. The production was eventually brought in under-budget at $78 million. Collins adapted the novel for film herself, in collaboration with screenwriter Billy Ray and director Gary Ross. The screenplay remains extremely faithful to the original novel, with Ross saying he "felt the only way to make the film really successful was to be totally subjective", echoing Collins' presentation of the novel in the first person present. Instead of Katniss' internal monologue about the Capitol's machinations, the screenplay expanded the character of Seneca Crane, the Head Gamemaker, to allow several developments to be shown directly to the audience. Ross explained, "In the book, Katniss speculates about the game-makers' manipulations... in the film, we can't get inside Katniss's head, but we do have the ability to cut away and actually show the machinations of the Capitol behind the scenes. I created the game center and also expanded the role of Seneca Crane for those reasons. I thought it was tonally important." Ross also added several scenes between Crane and Coriolanus Snow, the elderly President of Panem, noting that "I thought that it was very interesting that there would be one generation [of Panem citizens] who knew that [the Games] were actually an instrument of political control, and there would be a successive generation who was so enamoured with the ratings and the showbiz and the sensations and the spectacle that was subsuming the actual political intention, and that's really where the tension is". The Gamemakers' control center, about which Katniss can only speculate in the novel, was also developed as a location, helping to remind the audience of the artificial nature of the arena. Ross commented, "so much of the film happens in the woods that it's easy to forget this is a futuristic society, manipulating these events for the sake of an audience. The look of the control center, the antiseptic feeling of it and the use of holograms were all intended to make the arena feel 'constructed' even when you weren't seeing the control room." Ross and visual effects supervisor Sheena Duggal were keen to use the omniscient view that the setting provided to justify the literal dei ex machina Katniss experiences in the arena; Duggal explained that "we really didn't want to have to explain things... how do you get compelled by these [animals] that just appear at the end of the movie? We wanted to find a way to introduce them without having to explain specifically and exactly what they were and the game room was a really great opportunity for us to be able to do that." 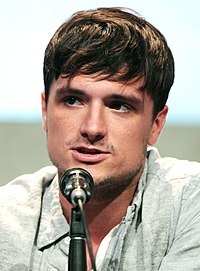 Josh Hutcherson plays Peeta Mellark in the film. Lionsgate confirmed in March 2011 that about 30 actresses auditioned or read for the role of Katniss Everdeen, including Hailee Steinfeld, Abigail Breslin, Emma Roberts, Saoirse Ronan, Chloë Grace Moretz, Jodelle Ferland, Lyndsy Fonseca, Emily Browning, Shailene Woodley, and Kaya Scodelario. On March 16, 2011, it was announced that Jennifer Lawrence (who was at the time filming for X-Men: First Class) had landed the coveted role. Ross described Lawrence as having "an incredible amount of self-assuredness, you got the sense that this girl knew exactly who she was. And then she came in and read for me and just knocked me out; I'd never seen an audition like that before in my life. It was one of those things where you just glimpse your whole movie in front of you." Though Lawrence was 20 when filming began, four years older than the character, Collins said that the role demanded "a certain maturity and power" and said she would rather the actress be older than younger. She added that Lawrence was the "only one who truly captured the character I wrote in the book" and that she had "every essential quality necessary to play Katniss". Lawrence, a fan of the books, took three days to accept the role, initially intimidated by the size of the production. Contenders for the role of Peeta other than Hutcherson included Alexander Ludwig (who was later cast as Cato), Hunter Parrish, Lucas Till, and Evan Peters. Other actors considered for the role of Gale included David Henrie, Drew Roy, and Robbie Amell. In April 2011, John C. Reilly was in talks with Lionsgate to portray Haymitch Abernathy. The following month Lionsgate announced that the role had gone to Oscar nominee Woody Harrelson. The casting of Grammy winner Lenny Kravitz as Cinna, Oscar nominee Stanley Tucci as Caesar Flickerman, and Toby Jones as Claudius Templesmith, soon followed. Both got the role at the time they were promoting Captain America: The First Avenger. Multiple-Golden Globe Award winner Donald Sutherland was cast as President Coriolanus Snow in late May 2011. The scene where Katniss tracks down Peeta was filmed at Bridal Veil Falls in DuPont State Forest. Gary Ross, Sam Mendes, David Slade, Andrew Adamson, Susanna White, Rupert Sanders, and Francis Lawrence were listed as possible directing candidates, but in the end Ross was announced as the film's director in November 2010. Fireman's Fund Insurance Company insured the production, but as part of the underwriting process insisted on a thorough risk analysis of hazards as diverse as wayward arrows, poison ivy, bears, bugs, and a chase across fast-running water. Lawrence dyed her blond hair dark for the part of Katniss. She also underwent extensive training to get in shape for the role, including archery, rock and tree climbing, combat, running, parkour, and yoga, and had an accident on the last day of her six-week training phase, in which she hit a wall while running at full speed, but was not seriously injured. Other stars who dyed their hair for the movie include Josh Hutcherson as Peeta and Liam Hemsworth as Gale. Lionsgate hired Olympic bronze medal-winning archer Khatuna Lorig to teach Lawrence how to shoot. With an initial budget of $75 million, principal photography began near Brevard in Transylvania County in Western North Carolina in May 2011 and concluded on September 15, 2011, with a final budget reported as between $90 and $100 million, reduced to $78 million after subsidies. Steven Soderbergh served as a second unit director, and filmed much of the District 11 riot scene. The movie was shot on film as opposed to digital due (in part) to the tightness of the schedule; as Ross said in an interview with The New York Times, "I didn't want to run the risk of the technical issues that often come with shooting digitally—we simply couldn't afford any delays." Virtually all production photography took place in North Carolina, with Lionsgate receiving tax credits of around $8 million from the state government to do so. Forbes magazine estimated that the state economy gained up to $60 million from the production, with over 5,000 people employed as extras, crew and support staff. 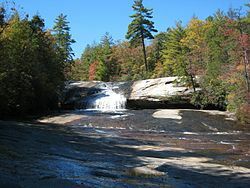 Most outdoor scenes, both from the arena and from the outskirts of District 12, were filmed in DuPont State Forest; the Little River, with its multiple waterfalls, provided several locations for shooting the river running through the arena. To run across Triple Falls, Lawrence was attached to wires and ran on a board. Many of the urban and interior locations, in the Capitol and elsewhere, were filmed in Shelby and Charlotte; other scenes also took place and was filmed in the Asheville area. Ross and production designer Phil Messina drew on the buildings of the 1939 New York World's Fair and symbols of political power including Tiananmen Square and Red Square, when designing the Capitol architecture, which they wanted "to be set in the future but have a sense of its own past... it's festive and alluring and indulgent and decadent but it also has to have the kind of might and power behind it". For Katniss' neighborhood in District 12, the production team found Henry River Mill Village, an abandoned mill town which Ross said "just worked perfectly for the movie to evoke the scene"; Messina explained that "originally we talked about maybe building one house and the facade of the house next door and redressing it, and maybe doing some CG extensions... we ended up finding a whole abandoned mill town... it was absolutely perfect". For the costume design, Judianna Makovsky and her crew looked at a lot of photographs of coal mining districts from the 1950s in the search of a very American feel. The idea was to create clothing unique for every character and to differentiate strongly the people in Capitol and in districts  Grey and blue prevailed in the color palette for the district, while the people in Capitol were chosen to look bright in theatrical hats, flowers, ruffles, with powdered and eyebrowless faces. The soundtrack album for The Hunger Games contains songs inspired by the film; only three of them ("Abraham's Daughter", "Safe & Sound", and "Kingdom Come", respectively) appear in the film itself, during the closing credits. The first single from the film's companion album, "Safe & Sound" by Taylor Swift featuring The Civil Wars, was released on December 23, 2011. It reached number one on the iTunes overall charts in 12 hours. The music video for "Safe & Sound" was released on February 13, 2012. Along with separate songs from Swift and The Civil Wars, the soundtrack also features songs by The Decemberists, Arcade Fire, The Secret Sisters, Miranda Lambert featuring The Pistol Annies, Neko Case, Kid Cudi Academy Award winner Glen Hansard, The Low Anthem, Punch Brothers, Birdy, Maroon 5, Jayme Dee, and Carolina Chocolate Drops. The soundtrack was released on March 20, 2012. The soundtrack track list was revealed on iTunes on February 13, 2012, and on the 14th "One Engine" was released as the second single. Jennifer Lawrence singing "Rue's Lullaby" was not included on the soundtrack. The album debuted at No. 1 on the Billboard Top 200 chart, having sold 175,000 copies in its first week. It is one of just 16 soundtracks to grace the top slot in the history of the Top 200 and the first since Michael Jackson's This Is It to debut at #1. Lionsgate originally announced that Danny Elfman and T-Bone Burnett would score The Hunger Games, with Burnett also acting as the film's executive music producer to produce songs for the soundtrack. Due to scheduling conflicts, Elfman was replaced by James Newton Howard. The score album was released on March 26, 2012. Arcade Fire also contributed to the movie's original score. The group composed the fascistic-inspired Panem national anthem, entitled "Horn of Plenty", an important and signature leitmotif appearing throughout the film. "We were interested in making music that would be more integral in the movie, just as a mental exercise," Butler, who co-wrote the song with Chassagne, explained. "And there's an anthem that runs throughout the books, the national anthem of the fascist Capitol. So as a thought experiment, we tried to write what that might sound like. It's like the Capitol's idea of itself, basically." He further added that "it's not a pop song or anything. More of an anthem that could be playing at a big sporting event like the [Hunger] Games. So we did a structure for that, and then James Newton Howard made a movie-score version of it that happens in several places in the film." Arcade Fire's Panem national anthem has received strong reviews. According to Spin, "'Horn of Plenty' pulls off the neat feat of sounding both exactly like Arcade Fire and exactly like a futuristic anthem. It still has one foot in the band's uncorrupted neighborhoods, but another is up on the podium at the end of Star Wars accepting an Olympic gold medal or something. Horns blare, a choir booms, strings swell, the martial percussion steals the show, and we just realized how much we love Big Brother." The film also features a rather obscure analog track from the 1970s composed by Laurie Spiegel for its "cornucopia scene", as well as music by Steve Reich, Ólafur Arnalds, and the Hypnotic Brass Ensemble. These do not appear on the soundtrack or score releases. The Hunger Games received mostly positive reviews from critics. Rotten Tomatoes gives the film an 84% approval rating, based on 298 reviews, and an average rating of 7.28/10. The site's consensus states, "Thrilling and superbly acted, The Hunger Games captures the dramatic violence, raw emotion, and ambitious scope of its source novel." On Metacritic, the film has a score of 68 out of 100 score, based on reviews from 49 critics, indicating "generally favorable reviews". Audiences polled by CinemaScore gave the film a grade A. Many critics praised Jennifer Lawrence for her portrayal as Katniss Everdeen, as well as most of the main cast. According to The Hollywood Reporter, Lawrence embodies Katniss, "just as one might imagine her from the novel". Empire magazine said "Lawrence is perfect as Katniss, there's very little softness about her, more a melancholy determination that good must be done even if that requires bad things." Several critics have reviewed the film favorably and compared it with other young adult fiction adaptations such as Harry Potter and Twilight. Justin Craig of Fox News rated the film as "[e]xcellent" and stated: "Move over Harry Potter. A darker, more mature franchise has come to claim your throne." Rafer Guzman of Newsday referred to The Hunger Games as being "darker than 'Harry Potter,' more sophisticated than 'Twilight'." David Sexton of The Evening Standard stated that The Hunger Games "is well cast and pretty well acted, certainly when compared with Harry Potter's juvenile leads". Roger Ebert of the Chicago Sun-Times gave the film three stars out of four, praising the movie as "effective entertainment" and Lawrence's performance. Despite being a largely positive review, he criticized the film for being too long and noted that the film misses opportunities for social criticism. Simon Reynolds of Digital Spy gave the film four stars out of five, calling it "enthralling from beginning to end, science fiction that has depth and intelligence to match its pulse-racing entertainment value". Reynolds also spoke highly of Lawrence's performance and director Gary Ross, whose "rough and ready handheld camerawork" meant that viewers were "with Katniss for every blood-flecked moment of her ordeal in the combat arena". However, film critic David Thomson of the magazine The New Republic called it a "terrible movie", criticizing it for a lack of character development and unclear presentation of the violence, describing the latter as "un-American". Eric Goldman of IGN awarded the film four out of five stars, stating that director Gary Ross "gets the tone of The Hunger Games right. This is a grounded, thoughtful and sometimes quite emotional film, with its dark scenario given due weight. Ross doesn't give the film a glossy, romanticized 'Hollywood' feel, but rather plays everything very realistically and stark, as Katniss must endure these outrageous and horrible scenarios." The film received some criticism for its shaky camera style, but it was said to "add to the film in certain ways". The violence drew commentary as well. Time critic Mary Pols considered that the film was too violent for young children, even though the violence had been toned down compared with the novel, while critic Théoden Janes of the Charlotte Observer found that "[...] the violence is so bland it dilutes the message". Also writing in Time, psychologist Christopher J. Ferguson argued that parents' fears of the effect of the film's violent content on their children were unnecessary, and that children are capable of viewing violent content without being psychologically harmed. The Hunger Games earned $408 million in the US & Canada, and $286.4 million in other countries, for a worldwide total of $694.4 million. It made the largest worldwide opening weekend for a film not released during the summer or the holiday period, earning $211.8 million, which was just ahead of Alice in Wonderland's previous record ($210.1 million). In North America, The Hunger Games is the 22nd-highest-grossing film, the highest-grossing film released outside the summer or holiday period, and the highest-grossing film distributed by Lionsgate. Box Office Mojo estimates that the film sold more than 50 million tickets in the US. The film set a midnight-gross record for a non-sequel ($19.7 million), which is also the tenth-highest midnight gross overall. On its opening day, it topped the box office at $67.3 million (including midnight showings), setting opening-day and single-day records for a non-sequel. The film also achieved the sixteenth-highest opening-day and nineteenth-highest single-day grosses of all time. For its opening weekend, the movie retained the No. 1 spot and grossed $152.5 million, breaking Alice in Wonderland's opening-weekend records for a film released in March, for any spring release, and for a non-sequel. Its opening weekend gross was also the largest for any film released outside the summer season and the eighth-largest overall. The film held the March and spring opening weekend records for four years until they were broken by Batman v Superman: Dawn of Justice. It remained in first place at the North American box office for four consecutive weekends, becoming the first film since Avatar to achieve this. On June 10, 2012 (its 80th day in theaters), it became the 14th movie to pass the $400-million-mark. On April 20, 2012, Lionsgate and IMAX Corporation announced that due to "overwhelming demand", The Hunger Games would return to North American IMAX cinemas on April 27 for a further one-week engagement. Outside North America, the film was released in most countries during March and April 2012, with the exception of China, where it was released in June 2012. On its first weekend ( March 23–25, 2012), the film topped the box office outside North America with $59.25 million from 67 markets, finishing at first place in most of them. The largest opening weekends were recorded in China ($9.6 million), Australia ($9.48 million), and the UK, Ireland and Malta ($7.78 million). In total earnings, its highest-grossing markets after North America are the UK ($37.3 million), Australia ($31.1 million) and China ($27.0 million). 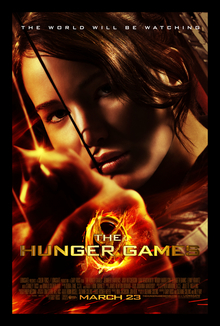 With regard to ticket sales, The Hunger Games broke the record for first-day advance ticket sales on Fandango on February 22, 2012, topping the previous record of The Twilight Saga: Eclipse. The sales were reported to be 83 percent of the site's totals for the day. According to first tracking, unaided awareness for The Hunger Games was 11%, definite interest was 54%, first choice was 23% and total awareness was 74%. In the week leading up to its release, the film sold-out over 4,300 showings via Fandango and MovieTickets.com On Fandango alone it ranks as the third-highest advance ticket seller ever behind The Twilight Saga: New Moon and Harry Potter and the Deathly Hallows – Part 2. Finally, according to Fandango it broke the site's single-day sales record (March 23), the mobile sales record for a weekend ( March 23–25, 2012) and the site's highest share of a film's opening weekend (Fandango sold 22% of the film's opening weekend tickets). Interpretations of the film's themes and messages have been widely discussed among critics and general commentators. In his review for The Washington Times, Peter Suderman expressed that "[m]aybe it's a liberal story about inequality and the class divide. Maybe it's a libertarian epic about the evils of authoritarian government. Maybe it's a feminist revision on the sci-fi action blockbuster. Maybe it's a bloody satire of reality television", but concludes the film only proposes these theories and brings none of them to a reasonable conclusion. Reviewers and critics have differing views on whether the film represents feminist issues. Historically, among the "top 200 worldwide box-office hits ever ($350 million and up), not one has been built around a female action star". Manohla Dargis sees Katniss Everdeen as a female hero following in the lineage of "archetypal figures in the literature of the American West" such as Natty Bumppo, as well as characters portrayed by American actors such as John Wayne and Clint Eastwood. Katniss is also seen as defying normative gender roles: she exhibits both "masculine" and "feminine" traits equally. Dargis also notes that Katniss is a female character with significant agency: "Katniss is a fantasy figure, but partly what makes her powerful—and, I suspect, what makes her so important to a lot of girls and women—is that she's one of the truest feeling, most complex female characters to hit American movies in a while. She isn't passive, she isn't weak, and she isn't some random girl. She's active, she's strong and she's the girl who motivates the story." Similarly, Shelley Bridgeman of The New Zealand Herald wrote that because the characteristics of "athleticism, strength, courageousness and prowess at hunting" are not given to a male protagonist, but to Katniss, her character is an abrupt departure from the stereotypical depiction of women as being innately passive or helpless. Mahvesh Murad of The Express Tribune said that the film's triumph is "a young female protagonist with agency", comparing her with Joss Whedon's Buffy Summers. The film has drawn varying interpretations for its political overtones, including arguments in favor of left-wing, right-wing, and libertarian viewpoints. Bob Burnett of The Huffington Post observed the film displays a general distrust of government, regardless of the audience's political party affiliation. Steven Zeitchik and Emily Rome, in the Dallas Morning News, also stated that some viewers formed an opinion about The Hunger Games as a parable of the Occupy Wall Street activity. The Huffington Post reported that Penn Badgley, a supporter of Occupy Wall Street, saw the film as a social commentary on the movement. Burnett also states that "Collins doesn't use the terms 1 percent and 99 percent, but it's clear that those in the Capitol are members of the 1 percent and everyone in the Panem districts is part of the 99 percent". Steven Zeitchik and Emily Rome, in the Los Angeles Times and the Dallas Morning News reported that, among other disparate interpretations, some viewers saw The Hunger Games as a Christian allegory. Jeffrey Weiss of Real Clear Religion, published in the Star Tribune has remarked on what he saw as the intentional absence of religion in The Hunger Games universe, and has commented that while the stories contain no actual religion, people are "find[ing] aspects that represent their own religious values" within it. Charles McGrath, writing for The New York Times, said that the film will remind viewers of the television series Survivor, a little of The Bachelorette, and of the short story "The Lottery" by Shirley Jackson published in 1948 by The New Yorker. David Sexton of The Evening Standard compared The Hunger Games unfavourably to Kinji Fukasaku's Japanese film Battle Royale, as did several other critics; the novel had earlier faced criticism for its similarities to the novel Battle Royale by Koushun Takami. Jonathan Looms of The Oxford Student argues that it is "unfair that the film is only drawing comparisons with Battle Royale" but that it "is a veritable pastiche of other movies" as well, comparing it to The Truman Show, Death Race, the Bourne films, and Zoolander, and that it is common for artists to borrow from and "improve on many sources. Quentin Tarantino has built his career on this principle." It reminded an author at Salon of the 1932 film The Most Dangerous Game. The Hunger Games has also been conceptually compared to Robert Sheckley's 1953 short story "Seventh Victim" and its 1965 Italian film adaptation by Elio Petri, The 10th Victim, as the story and film feature a government-endorsed, televised (in the film's case) "Big Hunt", featuring contestants from around the world acting as "hunters" and "victims". Wheeler Winston Dixon, a film professor at the University of Nebraska-Lincoln, listed several precedents: Battle Royale, Jackson's "The Lottery", William Golding's Lord of the Flies, Metropolis, Blade Runner, Death Race 2000, and George Orwell's Nineteen Eighty-Four. Manohla Dargis in The New York Times compares it to Battle Royale, Ender's Game, and Twilight, but contrasts The Hunger Games in terms of how its "exciting" female protagonist Katniss "rescues herself with resourcefulness, guts and true aim". Steve Rose of The Guardian refers to the film as "think Battle Royale meets The Running Man meets Survivor". Writing in The Atlantic, Govindini Murty made a list of touchstones the film alludes to, from the ancient Greek, Roman and Egyptian civilizations to modern references such as the Great Depression, the Vietnam and Iraq Wars, and reality television. For her part, author Collins cites the myth of Theseus, reality television and coverage of the Iraq War as her inspiration. During the film's opening weekend, controversial statements about various members of the cast arose, sparking open dialogue about issues of racism, sexism and unrealistic body image. Comparisons were also made between The Hunger Games premise of children killing each other, and the child soldiers of the Lord's Resistance Army led by Joseph Kony. In a Jezebel article published March 26, 2012, Dodai Stewart reported that several users on Twitter posted racist tweets, criticizing the portrayals of Rue, Thresh and Cinna by African American actors. In a 2011 interview with Entertainment Weekly, Collins stated that while she did not have any ethnic background in mind for lead characters Katniss and Gale because the book is written in "a time period where hundreds of years have passed" and there would be "a lot of ethnic mixing", she explains "there are some characters in the book who are more specifically described", and states that both Rue and Thresh are African American. Lyneka Little of The Wall Street Journal states that although it is easy to find bigoted or offensive postings online, "the racist 'Hunger Games' tweets, because they are so shockingly ignorant even by the standards of the fringes of the internet, have kicked up a storm". Fahima Haque of The Washington Post, Bim Adewunmi of The Guardian, and Christopher Rosen of The Huffington Post all reiterate the fact that Rue and Thresh are described in The Hunger Games as having dark brown skin, as well as Collins's assertion that they were intended to be depicted as African Americans. Adewunmi remarked that "it comes to this: if the casting of Rue, Thresh and Cinna has left you bewildered and upset, consider two things. One: you may be a racist—congrats! Two: you definitely lack basic reading comprehension. Mazel tov!" Erik Kain of Forbes saw the controversy as a way to appreciate the value of free speech. He states that while society may never be free of racism, "racist comments made on Facebook and Twitter quickly become public record. Aggregations of these comments, like the Jezebel piece, expose people for what they are. Sure, many hide under the cloak of anonymity, but many others cannot or choose not to. And as the internet becomes more civilized and its denizens more accountable, this sort of thing carries more and more weight." Amandla Stenberg responded to the controversy with the following statement: "As a fan of the books, I feel fortunate to be part of The Hunger Games family... It was an amazing experience; I am proud of the film and my performance. I want to thank all of my fans and the entire Hunger Games community for their support and loyalty." Dayo Okeniyi was quoted saying "I think this is a lesson for people to think before they tweet" and "It's sad... We could now see where society is today. But I try not to think about stuff like that." A number of critics expressed disappointment in Lawrence's casting as Katniss because her weight was not representative of a character who has suffered a life of starvation. Manohla Dargis, in her review of the film for The New York Times stated "[a] few years ago Ms. Lawrence might have looked hungry enough to play Katniss, but now, at 21, her seductive, womanly figure makes a bad fit for a dystopian fantasy about a people starved into submission". Todd McCarthy of The Hollywood Reporter said that in certain scenes, Lawrence displays "lingering baby fat". These remarks have been rebuked by a number of journalists for pushing unrealistic body image expectations for women. L.V. Anderson of Slate states that "[j]ust as living in a world with abundant calories does not automatically make everyone fat, living in a dystopian world like Panem with sporadic food access would not automatically make everyone skinny. Some bodies, I daresay, would be even bigger than Lawrence's." Since none of Lawrence's male co-stars have come under the same scrutiny, Anderson concludes complaints about Lawrence's weight are inherently sexist. MTV asked for responses from audiences on the controversy and reported that most found criticism of Lawrence's weight "misguided". One response pointed to Collins's physical description of Katniss in The Hunger Games novel which reads: "I stand straight, and while I'm thin, I'm strong. The meat and plants from the woods combined with the exertion it took to get them have given me a healthier body than most of those I see around me." Los Angeles Times writer Alexandra Le Tellier commented that "[t]he sexist commentary along with the racist barbs made by so-called fans are as stomach-churning as the film's cultural commentary, which, in part, shines a light on the court of public opinion and its sometimes destructive power to determine someone else's fate". The film has been rated 12A by the British Board of Film Classification (BBFC) in the UK for "intense threat, moderate violence and occasional gory moments". To achieve that rating, Lionsgate had to cut or substitute seven seconds of film by "digitally removing blood splashes and the sight of blood on wounds and weapons." The uncut version was ultimately released on Blu-ray in the UK with a 15 certificate. In the United States, the film was granted a PG-13 rating from the Motion Picture Association of America (MPAA) for "intense violent thematic material and disturbing images—all involving teens"; as Collins had originally anticipated. Screening of The Hunger Games was delayed indefinitely in Vietnam. The film was to be released on March 30, 2012, but, according to a member of the Vietnamese National Film Board, the Board considers the film to be too violent and unanimously voted for the indefinite delay. It was later banned. The film was released in North America and the Netherlands on DVD and Blu-ray Disc August 18, 2012, and in the rest of Europe on September 3, 2012. Extras include The World is Watching: Making The Hunger Games, numerous featurettes, the propaganda video in its entire form, a talk with the director Gary Ross and also Elvis Mitchell and a marketing archive. In its first weekend on sale, Lionsgate reported that 3.8 million DVD/Blu-ray Disc copies of the movie were sold, with more than one-third in the Blu-ray Disc format. Three weeks after the release of the movie to home media formats in the US, over 5 million DVD units and 3.7 million Blu-ray Disc units have been sold. With 10,336,637 sold, it became the top-selling video of 2012. The entire Hunger Games series was released on 4K UHD Blu-Ray on November 8, 2016. On August 8, 2011, while still shooting the film, Lionsgate announced that a film adaptation of the second novel in The Hunger Games trilogy, The Hunger Games: Catching Fire, was scheduled to be released on November 22, 2013. In November 2011, Lionsgate entered negotiations with screenwriter Simon Beaufoy to adapt the novel for screen, since the post-production schedule for The Hunger Games was too crowded for Ross and Collins to adapt the next film as originally planned. The Hunger Games: Catching Fire began production in the summer of 2012. Gary Ross did not return for Catching Fire, and instead Francis Lawrence directed the film. On May 6, 2012, it was reported that Michael Arndt was in talks to re-write the script for Catching Fire. Arndt officially signed on as the new script writer on May 24, 2012. The Hunger Games: Catching Fire began filming September 10, 2012, and concluded December 21, 2012; it premiered in London on November 11, 2013, before premiering on November 22, 2013 in the US as was originally scheduled. In July 2012, release dates were confirmed for two films based on the last book Mockingjay. The Hunger Games: Mockingjay – Part 1 was released November 21, 2014, and The Hunger Games: Mockingjay – Part 2 was released November 20, 2015. Lawrence, Hutcherson, Hemsworth, and Harrelson were all signed on to the whole franchise. ^ "The Hunger Games" (Press release). Lions Gate Entertainment. March 3, 2012. Retrieved March 3, 2012. ^ a b "The Hunger Games (12A)". British Board of Film Classification. March 12, 2012. Retrieved March 12, 2012. ^ a b c d e f "9 Untold Secrets of the High Stakes 'Hunger Games'". The Hollywood Reporter. February 1, 2012. Retrieved February 7, 2012. ^ a b c "The Hunger Games (2012)". Box Office Mojo. IMDb. Retrieved October 3, 2012. ^ Fleming, Mike (May 24, 2011). "Toby Jones In 'The Hunger Games'". Deadline Hollywood. Retrieved May 24, 2011. ^ "Hunger Games – released". AlloCiné.fr. Retrieved August 14, 2012. ^ Valby, Karen (January 25, 2011). ""The Hunger Games' gets a release date". Entertainment Weekly. Retrieved April 6, 2011. ^ Goldberg, Matt (February 2, 2012). "The Hunger Games Will Get a One-Week IMAX Run". Collider. Retrieved March 8, 2012. ^ "Biggest Single Days for Non-Sequels". OpusData. Archived from the original on March 27, 2012. Retrieved March 31, 2012. ^ a b "Weekend Report: Four-in-a-Row for 'The Hunger Games'". Boxofficemojo.com. IMDb. April 15, 2012. Retrieved April 21, 2012. ^ "Lionsgate Shop – The Hunger Games". Retrieved May 25, 2012. ^ "Top Selling DVDs of 2012". The-numbers.com. Retrieved May 10, 2013. ^ "A Killer Story: An Interview with Suzanne Collins, Author of 'The Hunger Games'"
^ Alexander, Bryan (March 26, 2012). "'Hunger Games' fans split hairs over blond star Lawrence". Retrieved April 27, 2012. ^ Joshua L. Weinstein (March 16, 2011). "Jennifer Lawrence Gets Lead Role in 'The Hunger Games'". The Wrap. Retrieved March 17, 2011. ^ a b Sperling, Nicole (April 4, 2011). "'The Hunger Games': Josh Hutcherson and Liam Hemsworth complete the love triangle". Los Angeles Times. Retrieved April 6, 2011. ^ a b Philiana Ng; Borys Kit (May 10, 2011). "Woody Harrelson Cast as Haymitch in 'Hunger Games'". The Hollywood Reporter. Retrieved May 11, 2011. ^ Donnelly, Matt (April 28, 2011). "Elizabeth Banks lands 'Hunger Games' role: Effie Trinket". Los Angeles Times. Retrieved May 10, 2011. ^ Valby, Karen (May 24, 2011). "Lenny Kravitz will play Cinna in 'Hunger Games'". Entertainment Weekly. Retrieved May 24, 2011. ^ Saad, Nardine (May 9, 2011). "Stanley Tucci cast in The Hunger Games". Los Angeles Times. Retrieved May 10, 2011. ^ Franich, Darren (May 31, 2011). "'Hunger Games': Donald Sutherland cast as President Snow". Entertainment Weekly. Retrieved June 13, 2011. ^ Ng, Philiana (May 5, 2011). "Wes Bently Lands Role of Seneca Crane in 'Hunger Games'". The Hollywood Reporter. Retrieved May 8, 2011. ^ a b Schaefer, Sandy (May 11, 2011). "'The Hunger Games' Casts Its Cato & Clove". Screen Rant. Retrieved May 11, 2011. ^ Ward, Kate (April 18, 2011). "'Hunger Games' casts Thresh and Rue". Entertainment Weekly. Retrieved April 18, 2011. ^ a b Valby, Karen (April 19, 2011). "'Hunger Games' casts its Glimmer and Marvel". Entertainment Weekly. Retrieved April 24, 2011. ^ a b Jay A. Fernandez and Borys Kit (March 17, 2009). "Lionsgate picks up 'Hunger Games'". The Hollywood Reporter. Retrieved April 6, 2011. ^ John A. Sellers (March 12, 2009). "Hungry? The Latest on 'The Hunger Games'". Publishers Weekly. Retrieved April 6, 2011. ^ a b "Lions Gate Has a Hit with 'Hunger Games.' Can It Turn a Profit?". The Daily Beast. April 2, 2012. Retrieved April 25, 2012. ^ "Lionsgate Feasts on The Hunger Games". ComingSoon.net. March 18, 2009. Retrieved April 6, 2011. ^ "Box Office History for Lionsgate Movies". Retrieved April 25, 2012. ^ a b c "How Lions Gate won 'Hunger Games'". Reuters. March 23, 2012. Retrieved April 25, 2012. ^ "The Hunger Games sequel faces possible delays as director demands higher fee". Daily Mail. April 6, 2012. Retrieved April 25, 2012. ^ Springen, Karen (August 5, 2010). "Marketing 'Mockingjay'". Publishers Weekly. Retrieved April 6, 2011. ^ "Hunger Games director Gary Ross bows out of sequel". Los Angeles Times. April 12, 2012. Retrieved April 25, 2012. ^ "The Hunger Games' Gary Ross". Writers Guild of America. March 23, 2012. Archived from the original on October 6, 2012. Retrieved April 25, 2012. ^ a b c Murphy, Mekado (March 30, 2012). "Gary Ross answers reader questions about 'The Hunger Games'". The New York Times. Retrieved April 25, 2012. ^ "Gary Ross: The Hunger Games". KCRW (Podcast). KCRW. March 21, 2012. Retrieved June 5, 2015. ^ a b "The Hunger Games" (Podcast). fxguide. Retrieved April 27, 2012. ^ Staskiewicz, Keith (March 3, 2011). "'}Hunger Games': Jennifer Lawrence, Saoirse Ronan, Chloe Moretz, Emma Roberts, and more up for Katniss". Entertainment Weekly. Retrieved April 6, 2011. ^ Joshua L. Weinstein (March 16, 2011). "Jennifer Lawrence Gets Lead Role in 'The Hunger Games'". The Wrap. Retrieved February 7, 2012. ^ Staskiewicz, Keith (March 17, 2011). "'Hunger Games': Is Jennifer Lawrence the Katniss of your dreams?". Entertainment Weekly. Retrieved February 7, 2012. ^ Valby, Karen (March 17, 2011). "'Hunger Games' director Gary Ross talks about 'the easiest casting decision of my life'". Entertainment Weekly. Retrieved March 21, 2011. ^ Franich, Darren (March 21, 2011). "'Hunger Games': Suzanne Collins talks Jennifer Lawrence as Katniss". Entertainment Weekly. Retrieved March 21, 2011. ^ Galloway, Steven (February 1, 2012). "Jennifer Lawrence: A Brand-New Superstar". The Hollywood Reporter. Retrieved February 7, 2012. ^ a b Kit, Borys (March 25, 2011). "Lionsgate Testing Actors to Star in 'Hunger Games' Opposite Jennifer Lawrence". The Hollywood Reporter. Retrieved April 6, 2011. ^ Brodesser-Akner, Claude (April 22, 2011). "John C. Reilly Being Offered Role of Haymitch in The Hunger Games". New York. Retrieved April 25, 2011. ^ "The Hunger Games casts Donald Sutherland as President Snow". Screenrant. May 31, 2012. Retrieved April 27, 2012. ^ Valby, Karen (January 6, 2011). "'Hunger Games' exclusive: Why Gary Ross got the coveted job, and who suggested Megan Fox for the lead role". Entertainment Weekly. Retrieved April 6, 2011. ^ a b Janet Morrissey (March 24, 2012). "Insuring Hollywood Against Falls (but Not Flops)". The New York Times. BU1. ^ Ayres, Tom (May 23, 2011). "Jennifer Lawrence 'unaware of Hunger Games hate'". Digital Spy. Retrieved December 18, 2011. ^ Still, Jennifer (May 26, 2011). "Jennifer Lawrence: 'Hunger Games training fun'". Digital Spy. Retrieved December 18, 2011. ^ Kung, Michelle (April 25, 2011). "Movie Studios Smell Out Teen Spirits". The Wall Street Journal. Dow Jones & Company. Retrieved May 12, 2011. ^ Lussier, Germain (May 27, 2011). "More 'Hunger Games' Casting: Lavinia the Avox, Venia and Flavius Played By Relative Unknowns". /Film. Retrieved May 27, 2011. ^ Adam Chitwood (August 4, 2011). "Steven Soderbergh is Directing Second Unit on The Hunger Games". Collider. Retrieved January 8, 2012. ^ Murphy, Mekado (March 30, 2012). "Gary Ross Answers Reader Questions About 'The Hunger Games'". The New York Times. Retrieved March 31, 2012. ^ "Will NC win the Hunger Games?". March 19, 2012. Retrieved April 30, 2012. ^ "North Carolina lures Hunger Games fans". CNN. March 27, 2012. Retrieved April 30, 2012. ^ Waggoner, Martha (April 1, 2012). "Fans of 'The Hunger Games' flock to the movie's North Carolina filming locations". NY Daily News. NYDailyNews.com. The Associated Press. Retrieved June 5, 2015. ^ Eisenberg, Eric (March 21, 2012). "Hunger Games Director Gary Ross Talks Handling The Phenomenon". Cinemablend. Retrieved May 8, 2012. ^ a b Hunger Games: Philip Messina. Retrieved May 8, 2012. ^ a b Creeden, Molly (March 19, 2012). "Dressing The Hunger Games: Costume Designer Judianna Makovsky". Vogue. Retrieved January 30, 2015. ^ Ana, Clement (January 30, 2015). "Hunger Games Inspired Fashion: Learn How to Dress Like Katniss and Effie". Glosty. Retrieved January 30, 2015. ^ Smith, Ethan (March 21, 2012). "'Hunger Games' Steps in to Save the Soundtrack". The Wall Street Journal. Retrieved March 21, 2012. ^ Hogan, Marc (December 23, 2011). "Listen to Taylor Swift's 'Hunger Games' Ballad". Spin. Retrieved December 23, 2011. ^ Atkinson, Claire (March 16, 2012). "'Hunger Games' soundtrack already a hit". New York Post. Retrieved December 11, 2013. ^ "The Hunger Games [Original Score]". Allmusic. Rovi Corporation. Retrieved January 16, 2013. ^ Kamminga, Brad (March 26, 2012). "The Hunger Games Score Review". Film Score Reviews. Archived from the original on June 3, 2013. Retrieved May 10, 2013. ^ Angie Han (June 29, 2011). "Danny Elfman and T-Bone Burnett to Collaborate on Hunger Games Score". SlashFilm. Retrieved December 23, 2011. ^ Germain Lussier (December 6, 2011). "Danny Elfman Out, James Newton Howard In For 'The Hunger Games'". SlashFilm. Retrieved December 23, 2011. ^ a b c "Arcade Fire Created the National Anthem of Panem! – Hunger Games". Hungergamesmovie.org. March 2, 2012. Archived from the original on May 5, 2012. Retrieved April 21, 2012. ^ a b c "Arcade Fire – 'Horn Of Plenty'". Stereogum. March 24, 2012. Retrieved April 21, 2012. ^ Hogan, Marc (March 26, 2012). "Arcade Fire Drop Dystopian 'Hunger Games' Anthem 'Horn of Plenty'". Spin. Retrieved March 23, 2014. ^ Dayal, Geeta (March 29, 2012). "Rare '70s Electronic Music Is Hidden in The Hunger Games". Wired. Retrieved March 29, 2012. ^ "The Hunger Games". Rotten Tomatoes. Fandango Media. Retrieved July 22, 2018. ^ "The Hunger Games". Metacritic. CBS Interactive. Retrieved November 21, 2015. ^ "Cinemascore". Cinemascore.com. CinemaScore. Retrieved July 22, 2018. ^ a b Johnson, Neala (March 19, 2012). "The Hunger Games wows the critics". The Daily Telegraph. Retrieved March 21, 2012. ^ Craig, Justin (March 21, 2012). "REVIEW: Excellent 'Hunger Games' poised to claim 'Harry Potter' franchise throne". Fox News. Retrieved March 26, 2012. ^ Rafer, Guzman (March 20, 2012). "Review: 'The Hunger Games' darker than 'Harry Potter,' more sophisticated than 'Twilight'". Newsday. Retrieved March 26, 2012. ^ a b Sexton, David (March 23, 2012). "The Hunger Games – review". Evening Standard. Retrieved March 25, 2012. ^ Ebert, Roger (March 20, 2012). "The Hunger Games". Chicago Sun-Times. Retrieved March 24, 2012. ^ Reynolds, Simon (March 19, 2012). "'The Hunger Games' review". Digital Spy. Retrieved March 21, 2012. ^ "David Thomson: Why I Hate 'The Hunger Games' | The New Republic". Tnr.com. Retrieved April 21, 2012. ^ a b Goldman, Eric (March 16, 2012). "The Hunger Games Review". IGN. NewsCorp. Retrieved March 21, 2012. ^ Mary Pols (March 22, 2012). "Why I'm NOT Taking My 8-Year Old To The Hunger Games". Time. ^ Christopher J. Ferguson (March 20, 2012). "Is the Hunger Games too dark for kids?". Time. ^ "Worldwide Openings". Box Office Mojo. IMDb. Retrieved May 3, 2012. ^ a b Subers, Ray (March 25, 2012). "Weekend Report: 'The Hunger Games' Devours $152.5 Million". Box Office Mojo. IMDb. Retrieved March 31, 2012. ^ "The Hunger Games (2012)". Box Office Mojo. Retrieved May 31, 2016. ^ Smith, Grady (March 23, 2012). "'The Hunger Games' earns a record-breaking $19.7 million at midnight screenings". Entertainment Weekly. Retrieved March 31, 2012. ^ Ray Subers (March 24, 2012). "Friday Report: 'Hunger Games' Kills With Fifth-Best Opening Day Ever". Box Office Mojo. IMDb. Retrieved March 25, 2012. ^ "Top Single Day Grosses". Box Office Mojo. Retrieved July 13, 2016. ^ "Top Opening Day Grosses". Box Office Mojo. Retrieved July 13, 2016. ^ "'Hunger Games' battles to $155M opening weekend". Access Hollywood. March 25, 2012. Retrieved March 12, 2013. ^ Daniel, David (March 26, 2012). "'Hunger Games' sets box office records". CNN. Retrieved March 31, 2012. ^ Pederson, Nicole (March 25, 2012). "Weekend Box Office – The Hunger Games Hits $155 Million for Third Highest Opening of All Time!". Collider. Retrieved March 31, 2012. ^ Young, John (March 25, 2012). "Box office report: 'The Hunger Games' posts third-best opening weekend ever with $155 mil". Entertainment Weekly. Retrieved March 31, 2012. ^ Brevet, Brad (March 27, 2016). "'Batman v Superman' Dominates the Box Office, Opening With $420 Million Worldwide". Box Office Mojo. Retrieved March 28, 2016. ^ Subers, Ray (April 1, 2012). "Weekend Report: 'Wrath,' 'Mirror' No Match for 'Hunger Games'". Box Office Mojo. Retrieved April 2, 2012. ^ "Weekend Report: 'Hunger Games' Three-peats, Passes $300 Million Over Easter". Box Office Mojo. April 8, 2012. Retrieved April 21, 2012. ^ "Weekend Report: 'Madagascar' Breaks Out, 'Prometheus' Catches Fire". Box Office Mojo. Retrieved June 11, 2012. ^ "The Hunger Games Returns To Select IMAX® Theatres For A One Week Engagement". IMAX Corporation. April 20, 2012. Archived from the original on July 2, 2012. Retrieved April 22, 2012. ^ a b c "The Hunger Games – International Box Office Results". Box Office Mojo. Retrieved March 31, 2012. ^ a b Segers, Franks (June 17, 2012). "Foreign Box Office: 'Madagascar 3' Repeats as No. 1 Overseas, Grossing Nearly $157 Million in Two Rounds". The Hollywood Reporter. Retrieved June 19, 2012. ^ "Around-the-World Roundup: 'The Hunger Games' Not Quite As Strong Overseas". Box Office Mojo. March 27, 2012. Retrieved April 2, 2012. ^ Segers, Franks (March 25, 2012). "Foreign Box Office: 'Hunger Games' Opens No. 1 Abroad in Unspectacular Fashion, Drawing $59.3 Million". The Hollywood Reporter. Retrieved March 26, 2012. ^ Semigran, Aly (February 24, 2012). "'The Hunger Games' breaks a 'Twilight' ticket sales record; hundreds of showings already sold out". Entertainment Weekly. Retrieved February 17, 2012. ^ McClintok, Pamela (April 16, 2012). "'The Avengers' Tracking to Open North of $150 Million, Strong as, 'Dark Knight'". The Hollywood Reporter. Archived from the original on April 16, 2012. Retrieved April 16, 2012. ^ Joal Ryan (March 22, 2012). "The Hunger Games: Is It Already the Biggest Thing Ever?!". E! Online. Retrieved March 22, 2012. ^ Subers, Ray (March 22, 2012). "Forecast: 'Hunger Games' Targets Record Books". Box Office Mojo. Retrieved March 31, 2012. ^ Giardina, Carolyn (March 25, 2012). "Fandango Sold 17 'Hunger Games' Tickets Per Second at Peak Periods on Opening Day". The Hollywood Reporter. Archived from the original on August 25, 2012. Retrieved August 25, 2012. ^ Peter Suderman (March 21, 2012). "MOVIE REVIEW: 'The Hunger Games' offers a feast for sci-fi fans". The Washington Times. Retrieved April 4, 2012. ^ a b c Manohla Dargis; A.O. Scott (April 4, 2012). "A Radical Female Hero From Dystopia". The New York Times. Retrieved April 4, 2012. ^ Shelley Bridgeman (March 29, 2012). "'The Hunger Games is a feminist issue'". The New Zealand Herald. Retrieved April 3, 2012. ^ Mahvesh Murad (April 2, 2012). "Film review: The Hunger Games". The Express Tribune. Retrieved April 4, 2012. ^ a b Bob Burnett (March 30, 2012). "The Politics of The Hunger Games". The Huffington Post. Retrieved April 7, 2012. ^ "How did you feel after seeing 'The Hunger Games'? Viewers say it sends multiple messages". The Dallas Morning News. March 31, 2012. Retrieved April 1, 2012. The Hunger Games, the teen action-adventure film that opened to big numbers last weekend, is, without question, a parable of the Occupy Wall Street movement. It's also a cautionary tale about Big Government. And undeniably a Christian allegory about the importance of finding Jesus. The New Testament content of the film is also hard to miss—at least according to those who home in on the triangle of main characters. ^ "Penn Badgley Compares 'The Hunger Games' To Occupy Wall Street". The Huffington Post. March 21, 2012. Retrieved April 1, 2012. Penn Badgley, a staunch supporter of Occupy Wall Street, recently spoke to Vulture after the film's premiere in New York about how he interpreted "The Hunger Games" as a social commentary on OWS. ^ "What the 'The Hunger Games' really means". The Los Angeles Times. March 24, 2012. Retrieved April 1, 2012. And undeniably a Christian allegory about the importance of finding Jesus. ^ Weiss, Jeffrey (March 26, 2012). "'Hunger Games' snubs religion". Star Tribune. Archived from the original on March 29, 2012. Retrieved April 3, 2012. ^ McGrath, Charles (February 19, 2011). "Teenage Wastelands". The New York Times. Retrieved March 23, 2012. ^ Yang, Jeff (March 23, 2012). "'Hunger Games' Vs. 'Battle Royale'". The Wall Street Journal. Retrieved March 24, 2012. ^ Poland, David (March 20, 2012). "Review: The Hunger Games". Movie City News. Retrieved March 24, 2012. ^ Velez, Diva (March 22, 2012). "The Hunger Games". The Diva Review. Retrieved March 26, 2012. ^ Looms, Jonathan (March 28, 2012). "The Hunger Games: Battle Royale with cheese". The Oxford Student. ^ O'Hehir, Andrew (March 13, 2012). "What came before "The Hunger Games"". Salon. Salon Media Group. Retrieved August 26, 2012. ^ Ricky (November 16, 2013). "Essential Viewing for Fans of 'The Hunger Games': Part One". PopOptic. Retrieved May 16, 2016. ^ Winston Dixon, Wheeler (March 2, 2012). "The Hunger Games". University of Nebraska-Lincoln. Archived from the original on November 5, 2012. Retrieved March 23, 2012. ^ Manohla Dargis (March 22, 2012). "Tested by a Picturesque Dystopia". The New York Times. Retrieved March 23, 2012. ^ Rose, Steve (March 24, 2012). "This week's new films". The Guardian. Retrieved March 29, 2012. ^ Murty, Govindini (March 26, 2012). "Decoding the Influences in 'Hunger Games,' From 'Spartacus' to 'Survivor'". The Atlantic. Retrieved March 28, 2012. ^ "Hunger Games: Reality TV Gone Wild?". The Huffington Post. March 28, 2012. Retrieved March 31, 2012. ^ David Cox. "The Hunger Games fails to give teenagers food for thought". The Guardian. Retrieved March 31, 2012. ^ "Margy Burns Knight: Influence Of 'Kony 2012' Video Needs Moderation". Huffington Post. Retrieved April 21, 2012. ^ "Are kids ready for 'Hunger Games'?". Azdailysun.com. March 23, 2012. Retrieved April 21, 2012. ^ "Michaud: 'Hunger Games,' reality & dystopia". Newsday. New York. March 13, 2012. Retrieved April 21, 2012. ^ a b Christopher Rosen (March 26, 2012). "'Hunger Games' Racist Tweets: Fans Upset Because Of Rue's Race". The Huffington Post. Retrieved March 28, 2012. ^ a b Erik Kain (March 28, 2012). "Racist Reaction To 'The Hunger Games' Reminds Us That Free Speech Is A Good Thing". Forbes. Retrieved March 28, 2012. ^ Karen Valby (April 7, 2011). "Team 'Hunger Games' talks: Author Suzanne Collins and director Gary Ross on their allegiance to each other, and their actors". Entertainment Weekly. Retrieved March 28, 2012. ^ Lyneka Little (March 30, 2012). "'Hunger Games' Tweets Spur Debate About Racism". The Wall Street Journal. Retrieved March 30, 2012. ^ Fahima Haque (March 28, 2012). "Watching 'The Hunger Games' through a racial lens". The Washington Post. Retrieved March 28, 2012. ^ a b Bim Adewunmi (March 28, 2012). "'Why wasn't The Hunger Games cast as I imagined in my racist reading?!'". The Guardian. Retrieved March 28, 2012. ^ Justin Ravitz (March 28, 2012). "The Hunger Games' Amandla Stenberg Responds to Racist Tweet Scandal". Us Weekly. Retrieved March 28, 2012. ^ Mark Malkin (April 1, 2012). "Hunger Games Star Speaks Out About Racist Twitter Attacks—What Did He Say?". E! Online. Retrieved April 1, 2012. ^ Manohla Dargis (March 22, 2012). "Tested by a Picturesque Dystopia". The New York Times. Retrieved March 31, 2012. ^ Todd McCarthy (March 15, 2012). "The Hunger Games: Film Review". The Hollywood Reporter. Retrieved March 31, 2012. ^ Elizabeth Perle (March 26, 2012). "Hollywood's Hunger Games". The Huffington Post. Retrieved April 1, 2012. ^ a b L.V. Anderson (March 23, 2012). "Jennifer Lawrence Is Not "Too Big" To Play Katniss". Slate. Retrieved April 1, 2012. ^ Elizabeth Lancaster (March 28, 2012). "Was Jennifer Lawrence Too 'Curvy' To Play Katniss In 'Hunger Games'?". MTV. Retrieved April 1, 2012. ^ Elizabeth Lancaster (March 28, 2012). "'Hunger Games' Fans Have Spoken: Jennifer Lawrence Isn't Too Curvy". MTV. Retrieved April 1, 2012. ^ Alexandra Le Tellier (March 28, 2012). "'Hunger Games': Star's 'baby fat' shouldn't eclipse the film's message". Los Angeles Times. Retrieved April 1, 2012. ^ "THE HUNGER GAMES (BBFC reference CFF284121)". British Board of Film Classification. March 14, 2012. Archived from the original on March 13, 2013. Retrieved March 14, 2012. ^ "The Hunger Games". bbfc.co.uk. ^ "Should parents heed 'Hunger Games' rating?". Fox News. March 23, 2012. Retrieved March 24, 2012. ^ Hopkinson, Deborah (September 2009). "A riveting return to the world of 'The Hunger Games'". BookPage. Retrieved April 6, 2010. ^ "'The Hunger Games' screening delayed indefinitely". Tuoi Tre Newspaper. March 28, 2012. Archived from the original on December 14, 2013. Retrieved December 11, 2013. ^ "'The Hunger Games' bịcấ chiế tạ Việ Nam". VnExpress. Retrieved September 20, 2012. ^ "The Hunger Games (2012)". DVD Release Dates. Retrieved August 12, 2015. ^ "The Hunger Games (Blu-ray + Digital Copy)". Amazon. Retrieved August 12, 2015. ^ "3.8 million Hunger Games DVDs sold". Coming Attractions by Corona. Retrieved August 21, 2012. ^ "Top-Selling Video Titles in the United States 2012 - The Numbers". Retrieved April 26, 2015. ^ Weinstein, Joshua L (August 8, 2011). "The Hunger Games Sequel Set for 2013 Release". The Wrap. Retrieved August 15, 2011. ^ "Weekly Ketchup: Doctor Who returns to the big screen". Rotten Tomatoes. November 18, 2011. Retrieved November 19, 2011. ^ "'X-Men: First Class 2′To Begin Production In January 2013". Screen Rant. April 6, 2012. Retrieved April 21, 2012. ^ Nikki Finke (April 10, 2012). "Gary Ross Decides NOT to Direct 'Hunger Games Two: Catching Fire': Lionsgate In 'Shock'". Deadline Hollywood. Retrieved April 10, 2012. ^ Blauvelt, Christian (April 19, 2012). "Francis Lawrence offered 'Catching Fire' director gig". Entertainment Weekly. Retrieved April 21, 2012. ^ "Director Francis Lawrence Chosen For ‘Catching Fire’ Sequel To ‘Hunger Games’". Deadline Hollywood. Retrieved April 28, 2012. ^ Staskiewicz, Keith (May 3, 2012). "Francis Lawrence confirmed as 'Catching Fire' director". Entertainment Weekly. Retrieved May 3, 2012. ^ Kit, Borys (May 5, 2012). "Michael Arndt in Talks to Re-Write 'Hunger Games' Sequel 'Catching Fire' (Exclusive)". Hollywood Reporter. Retrieved May 6, 2012. ^ "Hunger Games Sequel Officially Titled The Hunger Games: Catching Fire". comingsoon.net. May 24, 2012. Retrieved November 10, 2012. ^ Cairns, Dan (September 11, 2012). "Newsbeat – Hunger Games: Catching Fire begins filming in Georgia". BBC. Retrieved September 20, 2012. ^ "'The Hunger Games: Catching Fire' World Premiere Lights Up the Red Carpet". The Hollywood Reporter. November 11, 2013. Retrieved November 28, 2013. ^ "The Two-Part 'Hunger Games' Finale 'Mockingjay' Sets Release Dates". movies.com. July 10, 2012. Retrieved July 11, 2012. ^ David Robert (November 18, 2011). "Woody Harrelson Talks 'Hunger Games'". MTV. Retrieved December 30, 2011.